I have many posts on the technology and terminology of tire failure but no matter what the cause or what you call it, a tire failure is not fun. Here is some information on what to do. Many on this forum are in motorhomes. Many also pull a toad, but others own or have friends with trailers or may even find themselves pulling a trailer. I will also include some information for those times too. First, for tire failure on a toad or trailer or the rear duals or tag of a motorhome it is critical that the driver is notified as soon as possible that there has been a failure or that one is about to occur. The only way I know of gaining this knowledge is with a tire pressure monitoring system (TPMS) that can alert the driver of air loss. Some TPMSs can even alert the driver in the first few seconds when the inflation has dropped just a few psi from the hot running pressure. 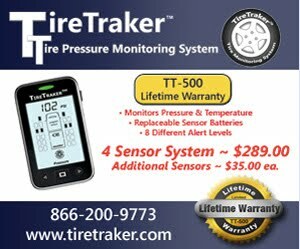 If you do not run a TPMS then you will not learn of the pressure loss before damage has been done, as you will be depending on passing motorists to get your attention. By this time, damage has been done, but hopefully the toad or trailer hasn't rolled over or separated from the motorhome, which could raise the level of severity of consequences dramatically. For motorhome or bus drivers the failure of a front tire can mean a significantly different outcome, as there is the real potential of a complete loss of control if the wrong response is taken. Here we know that a warning of initial air loss may provide enough time for a thoughtful response from the driver, but even having a TPMS is not a 100% guarantee as there are failures that do not involve air loss. So the question then is what actions need to be taken in the first fraction of a second after a front tire comes apart? Thankfully there is a good instructional video from Michelin of what a driver needs to do. Here is another instructional video. Yes, the advice is not intuitive to the average driver but it can work. It has been demonstrated numerous times that there is both proper and improper driver response to a tire failure. Sadly, many drivers have ended up turning an inconvenience into a tragedy. A driver needs to stop and think about what to do and to take a moment — frequently — to help implant the correct response so it can become an automatic response. You do have plenty of time to think about this as you drive down the highway. I would suggest that if you spent as little as 10 seconds once an hour every hour when driving, thinking about the correct response of maintaining control first then slowing down second — rather than just stomping on the brakes — the action may become automatic. We all know that practice and repetition can make athletes better at their "game." Well, in this case, practice, at least in thought, can make you a safer driver in the "job" of getting yourself and family safely to your destination a reality.